Stumptown Stories presents The Dream of the 90s in Rock and Clay on Tuesday, May 10, 2016 at Jack London bar (basement of the Rialto, SW 4th and Alder). The May installment of Stumptown Stories is coming up. 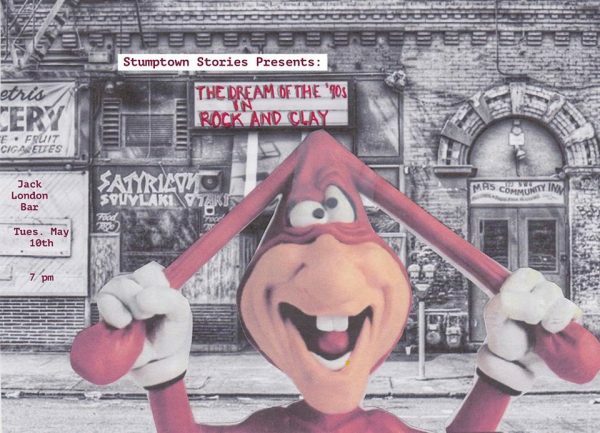 We’re calling this one “The Dream of the 90s in Rock and Clay.” JB Fisher will be talking about the ROCK (of the local alternative variety) and Joe Streckert will be talking about the CLAY (of the Will Vinton variety).